^ http://hal.archives-ouvertes.fr/docs/00/09/09/06/PDF/THE_HIGHER_PHYLOGENY_OF_AUSTRONESIAN.pdf Sagart, L. 2004. The higher phylogeny of Austronesian and the position of Tai–Kadai. Oceanic Linguistics 43.411-440. 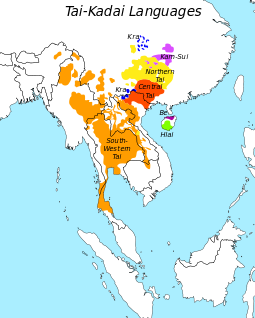 ^ Sagart, L. (1990) "Chinese and Austronesian are genetically related". Paper presented at the 23rd International Conference on Sino-Tibetan Languages and Linguistics, October 1990, Arlington, Texas.